Nice to meet you.I am your new friend to help you to become more prefect. My skin is practical, waterproof,lightweight,superior Nylon fabric, highly durable and stylish. I can provide enough capacity for daily carryings including cell phones,cash,credit cards,small cosmetics and other staffs.Layers design for better organizing your stuffs. Actually I can take Apple iPhone 6s Plus,6 plus,Iphone 6/6s/5s,Samsung Galaxy S6/S5,Note 5/Note 4,HTC,LG G4 and any cell phones less than 6 inch. I am a waterproof nylon shoulder bag which keep up with your daily activities while looking fabulous and remaining hands free. I have many dresses with different colors. I can deal with any occasions:Casual,walking,shopping and everyday use. I am a really worthwhile friend. Don't hesitate to take me away✌. 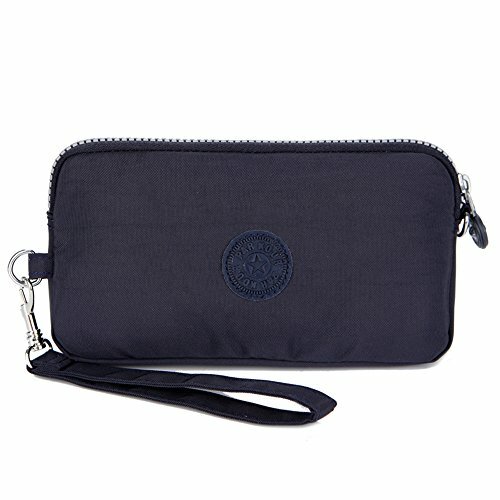 MATERIAL: Water-resistant Nylon cloth, Lining: Polyester, highly durable and stylish, suitable for wristlet handbag. Made with water-resistant nylon fabrics that protect your valuables no matter what the weather forecast may look like. DIMENSION: 7.9"(L)* 4"(H) *2"(W). With a wrist lanyard; It's light weight, very easy to carry. CUSTOMER SATISFACTION GUARANTEED： all SUMCOA products are fulfilled by Amazon and eligible for 100% free returns for 30 days with no questions asked. Enjoy a RISK FREE purchase today. STRUCTURE:Internal compartments *3, one zipper interlayer, card slots*6; It can hold more than 1 mobile phones\credit cards \note books\paper money\coins\keys \small cosmetics etc. More convenient and more easy to organizer your stuffs. VERSATILE:Women wristlet bag is suitable for ladies and girls, and it's a good choice for daily use, shopping, hiking and so on. If you have any questions about this product by Sumcoa, contact us by completing and submitting the form below. If you are looking for a specif part number, please include it with your message.